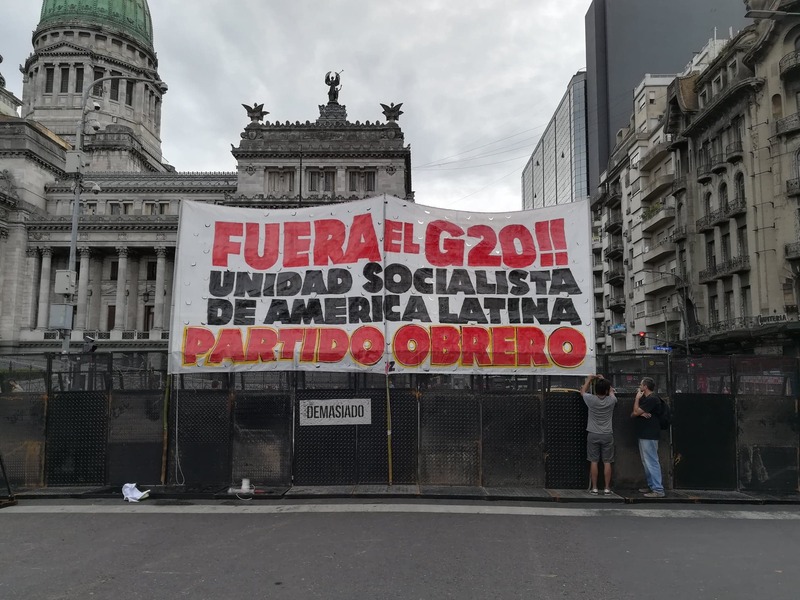 Thousands of anti-capitalist activists will take to the streets of Buenos Aires today as part of a week-long set of demonstrations against the G20 Leaders Summit that takes place in the capital. Attac Argentina, the local branch of a global movement, will be at the forefront of the protests. A confluencia of social advocates, trade unionist, academics and students will gather in Plaza Congreso between 10am and 11pm for the so-called “Cumbre de los pueblos,” a public forum hosting national and international members of social movements, including labour organisations CTEP and CTA Autónoma. Starting at 3pm Friday, the G20 summit’s inaugural day, the coalition is expected to meet between Avenidas San Juan and 9 de Julio to take part in a nationwide protest march, with satellite events taking place across Argentina. “The issues that will be discussed behind closed doors at the G20 summit, will be open to discussion for us,” said Javier Echaide, 44, a member of Attac Argentina and professor of international law at the University of Buenos Aires, told the Times. As a global movement critiquing neoliberal policies and free-trade agreements, the Association for the Taxation of Financial Transactions and for Citizens’ Action (Attac) is ideologically opposed to the G20. The organisation believes financial globalisation tends to favour the interests of international markets and multinational corporations, contributing to a substantial increase of socioeconomic inequalities in developing countries. “Generally, the only perspective adopted against neoliberal and free-trade policies is the protectionist one,” Echaide explained. “We instead promote the idea of an anti-capitalist system whose purpose is the satisfaction of basic needs and not capital gains. “The current Argentine government has implemented neoliberal policies at both a national and international level. For us, this represents a retrocession to the 1990s and it is very similar to what we experienced with the neoliberal policies of Carlos Menem, which led to the 2001 economic crisis,” he added. Unlike some other branches, Attac’s Argentine subsidy is small: members have rotating roles and decisions are agreed upon by consensus. The group does not have a headquarters location, nor does it identify with any political party. The government has repeatedly expressed concerns over groups who intend to protest against the G20 and the presence of its leaders in Buenos Aires. The Security Ministry has prepared an unprecedented city-wide plan that includes the deployment of 22,000 agents, the reinforcement of border and frontier controls and the application of new cybersecurity technologies. The operation has been prepared over the last year and covers two hypotheses of conflict: episodes of street violence and terrorist acts. Leftist and anarchist groups have been monitored over the past few months by the Federal Intelligence Agency (AFI), which has worked in close collaboration with international intelligence agencies, including the United States Central Intelligence Agency (CIA), Britain’s MI5 and Russia’s Federal Security Service (FSB). “We won’t tolerate violence of any kind, there will be popular demonstrations and we want the right of the people to be democratically respected,” Security Minister Patricia Bullrich declared at a press conference last week. Founded in France in 1998 by Ignacio Ramonet and Bernard Cassen, directors of Le Monde Diplomatique, Attac initially focused on promoting the introduction of the Tobin Tax, a levy on foreign exchange transactions, against one of the pillars of the capitalist system: the free movement of capital. Over time, however, the group enlarged its scope to include a variety of issues – from environmental policies to labour laws – and expanded into over a dozen countries throughout the Americas, Africa, Europe, and Asia. “We fight for the regulation of financial markets, the closure of tax havens, the introduction of global taxes to finance public goods, the implementation of limits to free trade and capital flows and debt cancellation in developing countries,” the organisation states on its website. In Argentina, however, Attac has been the subject of some controversy. Local news website Infobae recently reported that the group had been placed under investigation by the IGJ judicial watchdog (Inspección General de Justicia) for allegedly suspicious financial activities. According to the website, Attac cancelled its tax registration in Argentina in 2006, but a Credicoop Bank account linked to the group has received an inflow of funds via recent transactions. The latest included a payment for US$15,500, from the British NGO Global Justice Now, as well as another $20,000 from a law firm in Germany. The organisation confirmed to the Times that it had received the funds, though it denied any involvement in illegal activities, saying everything was legal and above board. “We haven’t received any notification regarding an ongoing investigation,” said Beatriz Rajland, former president of Attac.